Cook brussels sprouts in large pot of boiling salted water until crisp-tender, about 4 minutes. Drain. Sauté chopped bacon in heavy large skillet over medium-high heat until crisp, about 4 minutes. Using slotted spoon, transfer bacon to paper towels and drain. Heat bacon drippings in skillet over medium-high heat. Add brussels sprouts and chestnuts and sauté until brussels sprouts begin to brown, about 5 minutes. Add 1/2 cup water and cook until brussels sprouts are tender and most of liquid is absorbed but mixture is still moist, about 3 minutes longer. Stir in bacon. Season to taste with salt and pepper and serve. 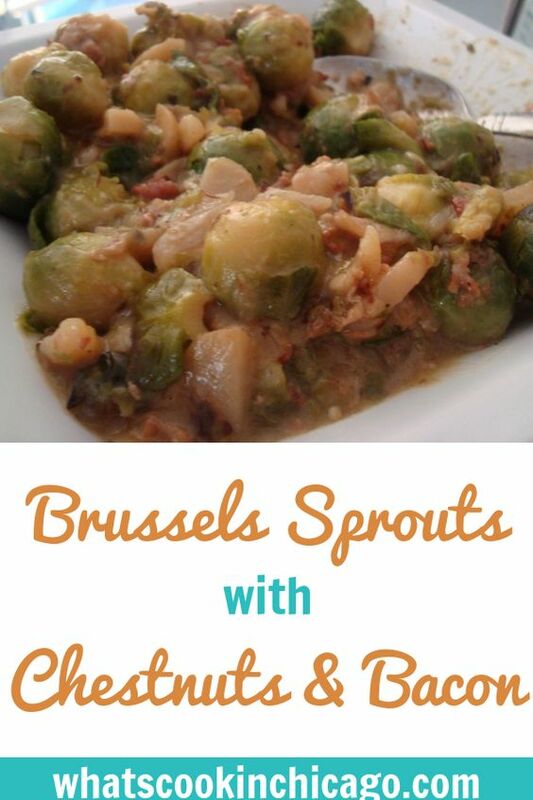 I just made a similar Brussels sprout / bacon / red onion dish that looks very close to this. And it was absolutely delicious! This sounds great. I made brussels sprouts with chestnuts and brown butter a while back and I love the chestnut/brussels sprout combo.